Since the trees have matured in downtown Roseburg, Green Herons have begun nesting downtown. 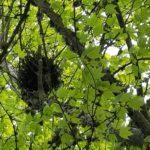 For the last two years, Umpqua Valley Audubon has conducted informal surveys of downtown streets to locate nests early in the season. Starting and ending at brew pubs doesn’t seem to diminish our citizen science effort. So, we’re making it an annual event! This year, we’re reversing course – starting at the south end of downtown and ending up near the Courthouse. We will leave from Salud Brewery, 723 SE Lane Ave at 5:30 PM, so arrive earlier to enjoy a brew if you’d like. From there, we’ll disburse to survey the trees along Rose, Jackson, Main and cross streets for nesting activity. This year, we’ll plan on gathering at Little Brother’s Pub, 428 SE Main St. around 6:30 to review our findings and to have a celebratory brew and snacks or dinner. You can walk as much or as little as you’d like. And, if walking isn’t your thing, just join us at Little Brother’s for conversation. This is a family friendly event – bring the kids! They’ll love spotting the nests!